WildCare’s Courtyard is located at 76 Albert Park Lane in San Rafael. Click for driving directions. Our Courtyard is open daily from 9am to 5pm (9am – 1pm on New Year’s Day, Thanksgiving, Christmas Eve, Christmas Day and New Year’s Eve.) Admission is FREE! Guided Center Tours with a special animal encounter are also available. The Courtyard is always available during open hours, but our Museum may be closed to visitors during Wildlife Camp sessions. All camps run from approximately 9am to 3pm on weekdays. Summer Wildlife Camp runs June through mid-August. Winter Wildlife Camp runs the last two weeks of December, and Spring Wildlife Camp runs in mid April. WildCare’s courtyard is home to over twenty non-releasable wild animals. All of our Wildlife Ambassadors have shown themselves adaptable to the demands and stresses of living near humans, and each of them provides an invaluable opportunity for the public to view native animals up close. 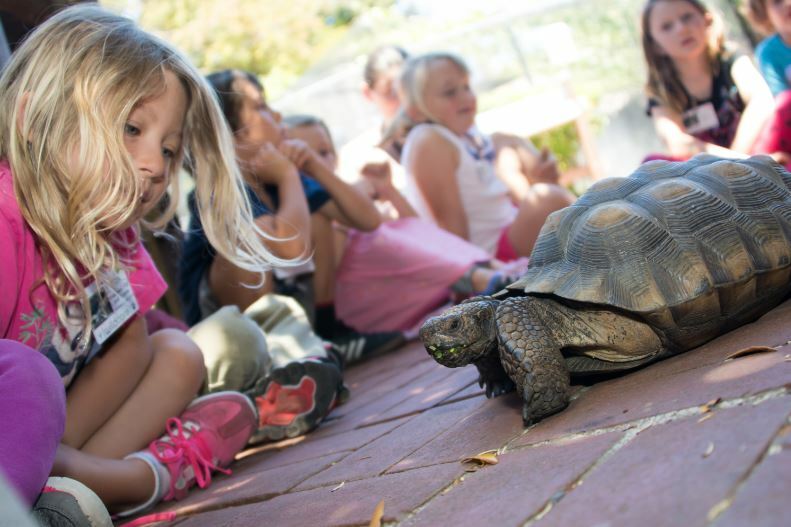 Many of our animals come out of their cages “on the glove” to meet school groups, scout troops and the general public. While the animal is the focus of attention, the human partner in an Ambassador team provides both a sense of safety and comfort for the animal while on display, and the knowledge of natural history that makes viewing these animals an educational experience for all. Introducing Marshall and Farallon, WildCare’s two newest Ambassadors! 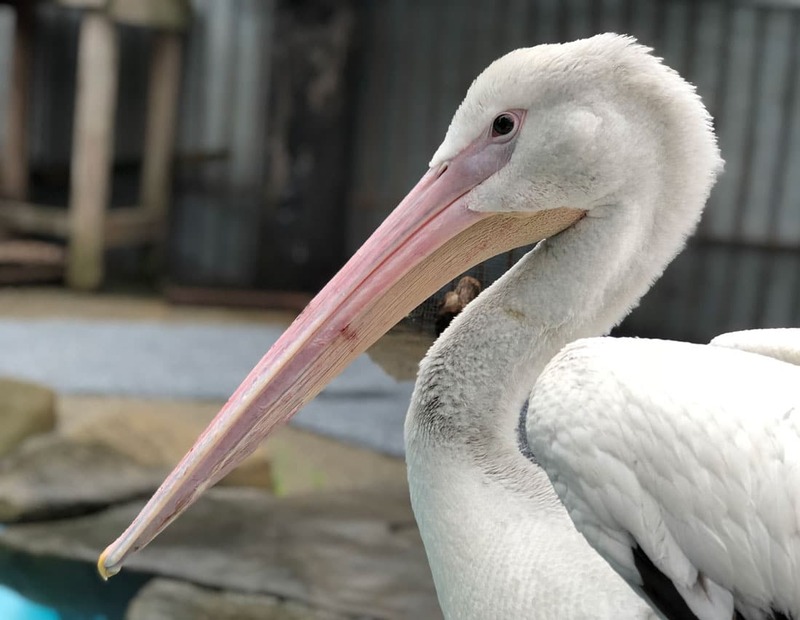 Marshall, our gorgeous American White Pelican, was named in loving memory of Jean Coil Carvalho. 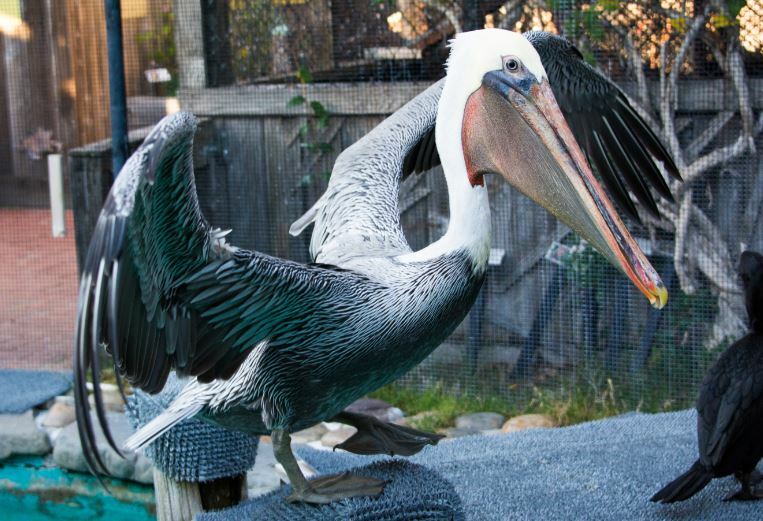 The name Marshall was chosen because white pelicans frequent marshlands (including the Corte Madera Ecological Reserve). Marshall came to WildCare from our friends at International Bird Rescue, where he was brought after being hit by a truck. Marshall suffered injuries, including permanent damage to his vision and traumatic brain injury that rendered him nonreleaseable. Farallon the Brandt’s Cormorant (photo above left) was also a patient in care at International Bird Rescue. We’re so grateful to IBR for helping us find two such delightful birds for our Education programs! The name Farallon was chosen by an online vote. With 32% of the votes, Farallon was the clear winner (Brandi came in second). The way people think about captive animals is changing. No longer do we accept just seeing a captive animal in a cage. We want a richer experience that includes an understanding of the animal’s habitat, physiology and natural history. And who is better able to teach us than the animals themselves? 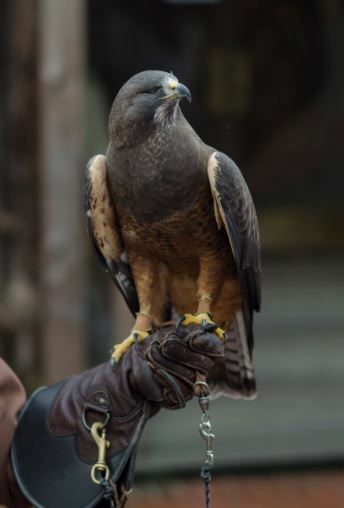 WildCare’s Wildlife Ambassador Program is a unique collaboration between animals and their human handlers designed to provide an enriched experience of animals on display. Through beautiful, informative courtyard signage, visitors are introduced to each Wildlife Ambassador and its personal story. The signs give fascinating facts about the species as well as addressing environmental issues faced by wild animals today. 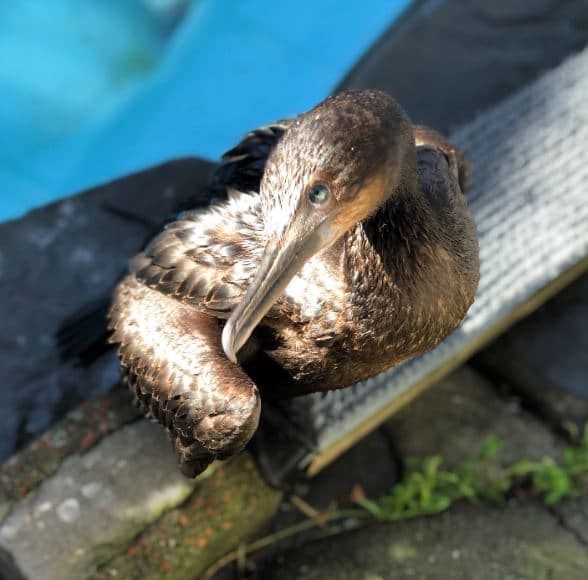 In their courtyard poolside enclosure, cormorants show off their diving prowess and pelicans splash into the water to scoop fish into their throat pouches. Members of the public can visit to learn about and watch our pool birds’ adaptations to their watery environment. Routines and training give captive animals activity and challenges. Behavior-enriching activities such as finding hidden food or eating food frozen like a popsicle are stimulating events that keep animals mentally and physically healthy. Maintaining the mental health of our Ambassador animals is an important component of being a Wildlife Ambassador volunteer.